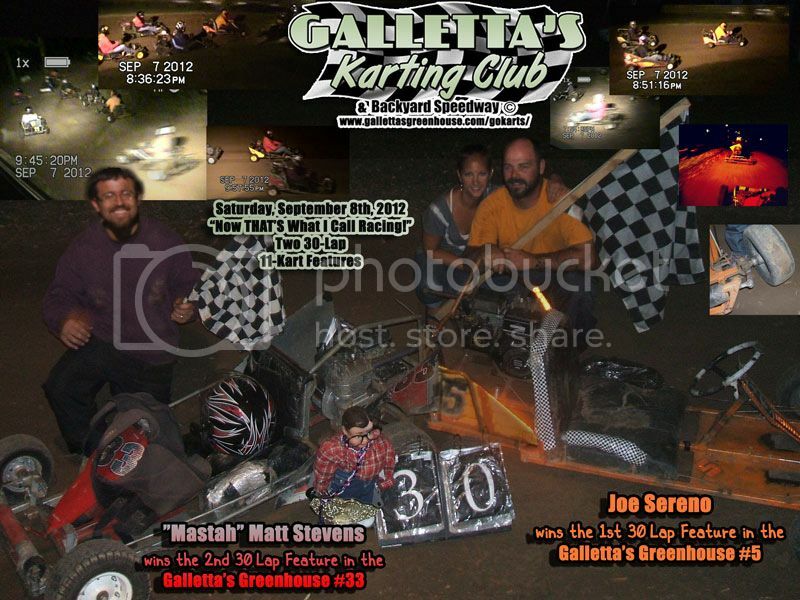 Galletta's Greenhouse Karting Club | September 7th, 2012 &quot;Now THAT'S a Better Buske! 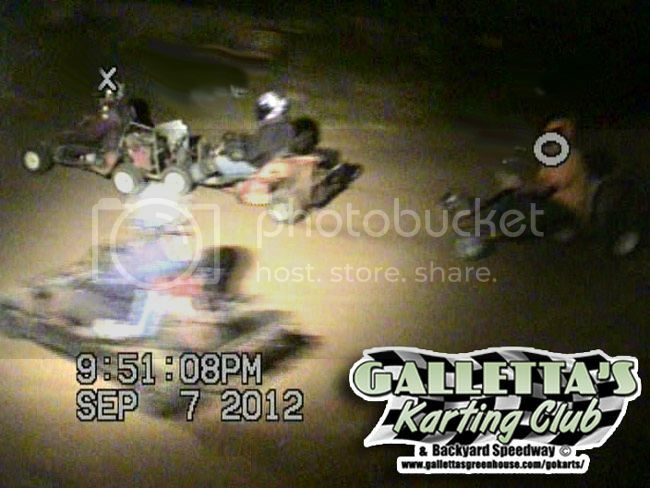 Twin-30s&quot; 60-Laps/11-Karts | Town of Oswego, NY! FRIDAY, SEPTEMBER 7th, 2012: Also known as, "Now THAT'S A Better Buske! Twin 30s", we ran 11-Karts in 60-Laps (our new regular-season favorite it seems - two 30 lap features) and had Joe Sereno take the first feature and Matt Stevens take the second. Great racing all around! 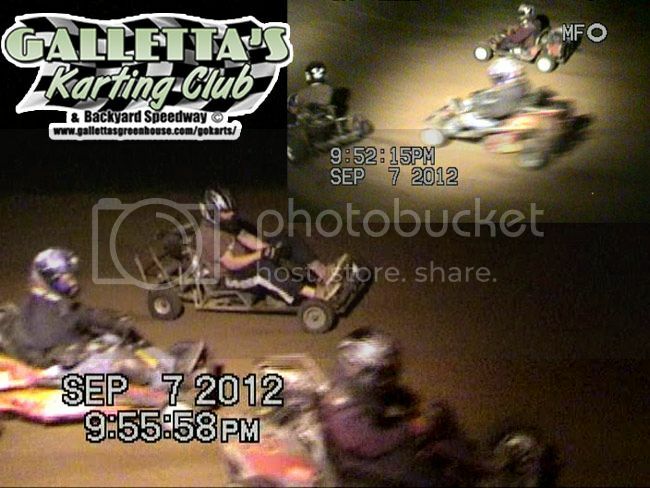 And now with a hemet cam for some awesome race footage! Check below, you very good people! Retcon races are short hot-lap sessions counted as a race and designed for two functions: For rookie drivers to get some track time seasoning before entering the regular races, and for regular racers and veterans who missed an earlier race to make-up those races that they missed, and help get back into the points race without penalizing those who did race in that event. All drivers are scored in the earliest race they missed, retroactively counted as if they were in that race. Nobody should be racing exceedingly hard in these races, and almost none of the drivers are actually racing each other and they are often counted in entirely different races. 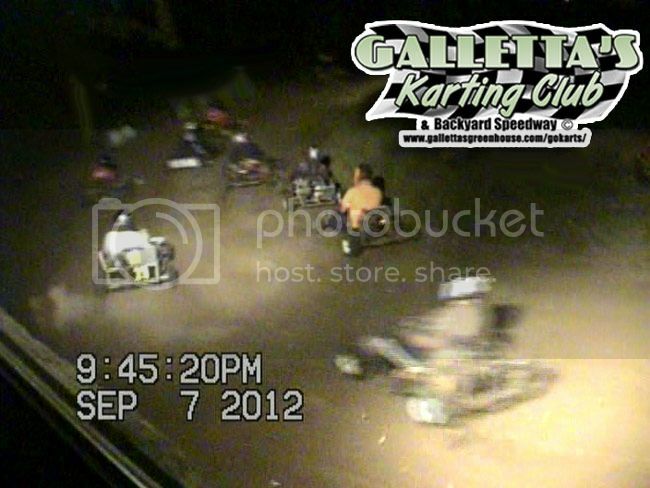 Thanks to the absent Randy Platt (had yet another wedding to attend on race day despite being around a few days building two or three karts), Matt Stevens ran the first ever helmet cam at Galletta's. Unfortunately, the camera does not have a low-light enhancement mode, so although the footage was excellent, it was spotty and only really good nearest to the lights. 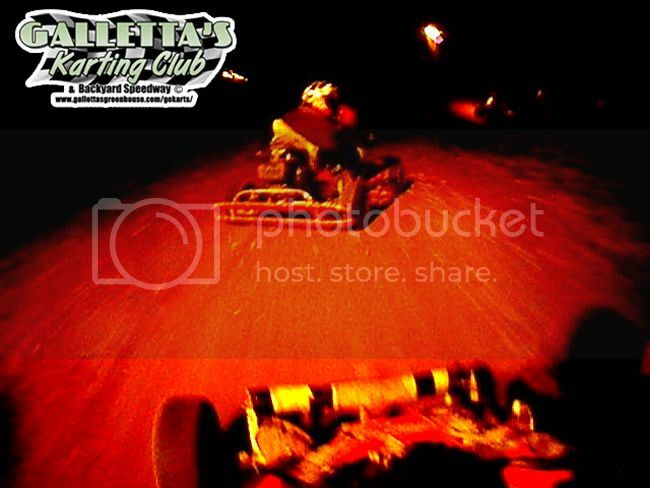 Here was see Matt driving the Galletta's #0 - one of the fastest karts in the fleet, a multi-time feature-winnner, and a multi-time top-two Klassic finisher, including the 2010 Klassic winning kart with Kyle Reuter behind the wheel - mainly because nobody drives it. Matt likes showing it has the ability to win any given week with an experienced driver at the helm, and had it up front all night once again. 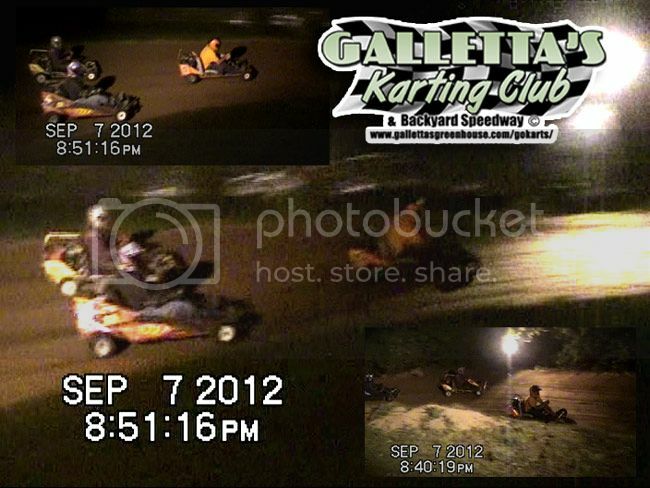 Here he follows his brother Chris, who was in the Galletta's/Chrusher.com #74 (which later broke a drivewheel off right off the bolts - racing karts simply cannot cut it on our heavy-duty ironman racing). William Truax led the first half of the race, but while leading, spun out and had to retire to work on the Galletta's #7 (to get ready for the 2nd feature). This put Joe Sereno - who trapped Matt when Matt was working on trying to get under Truax - into the lead, and he took the rest of the show, although Matt and Chris did stay with him and battle furiously for 2nd. Joe has now won three features within the last month, making up for lost time as he only won one in his first season of racing (and broke a few times up front). Per usual, the start of a 2nd twin-feature night is inverted from the first (except prior winners in the back, and newbie rookies in last until they prove they can learn their lines). And look at the start! 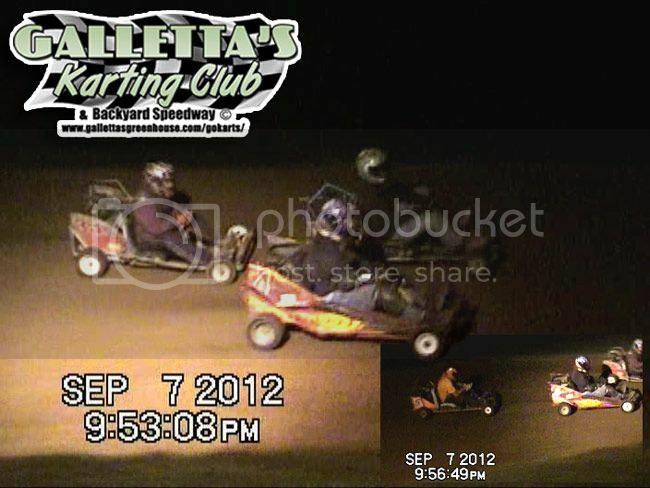 Such awesome racing on lap one! With this 2012 season thus far, we have more first season drivers than seasoned vets most weeks, and the seasoned vets are picking of the rookies left and right. Here Chris and Matt battled furiously through the field picking off competitors utilizing mostly the low groove. 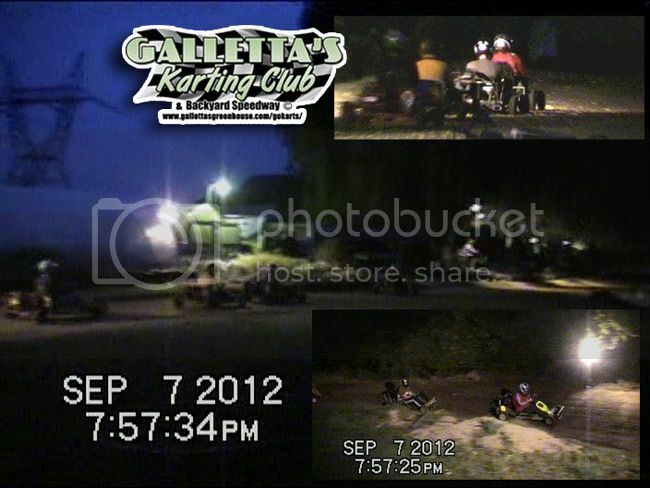 Here WIlliam Truax is showing great improvement in only his third week of racing at Galletta's. He again led nearly half of the second feature, when Chris caught up with him and began to test him for the lead. 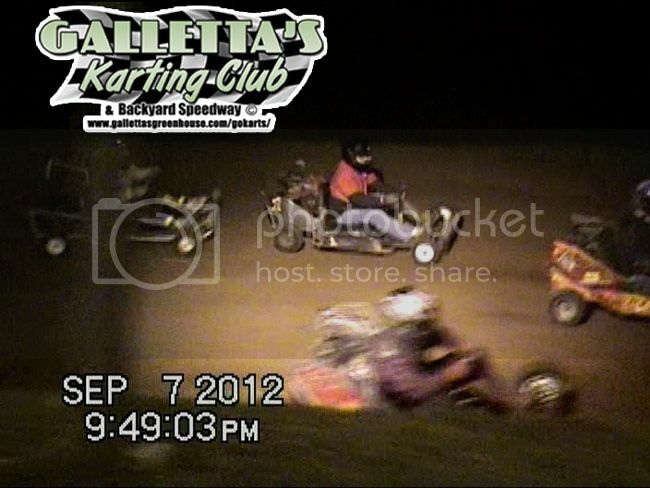 Matt then was able to trap Chris on him and Truax again held Matt off (one of the hardest tests to pass in a Galletta's Karting Club race, second only to PASSING Matt). But lapped traffic cost Truax, as Matt, Chris, Joe, and a few others trapped him in traffic. Matt was hounded by Chris and Joe for the rest of the night, and Matt had a few close calls when traffic got in the way, but Matt held them off for yet another feature win, still holding firm to his position as winningest known karting racer in the county and possibly the state and beyond since the early 1990s. Curses!